The Captains made their suggestions and we listened to create an even better EX-80. The harness lugs have been double to 4 for better handling and we've upgraded to a dual drag system for even smoother runs. Check out the new and improved model today and the full list of upgraded features below. 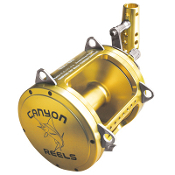 CANYON REELS EX-80 TWO SPEED TROLLING REELS PACK AN INCREDIBLE DRAG! The drag power of the EX-80 exceeds most 130 lb. class reels of other reel makers! The EX-80 is designed for giant fishing and has more than 150 lb. of drag at max strike position! The EX-80 is a monster reel, designed to stop monster fish! Nine stainless anti-rust bearings give the EX-80 incredibly smooth performance while packing 155 lb. of drag power into this reel. Tested in The Northeast on giants, the EX-80 features a pre-set feature for accurate drag settings, with our easy one-touch gear shifter. A max drag of 105 lb. at strike and over 155 lb. at full drag will get any fish to the boat! Extreme Power: Over 155 lb. of drag!! 105 lb. at max strike!